Cheers! Salute! Raise a glass to the Tulsa Drink Ticket! 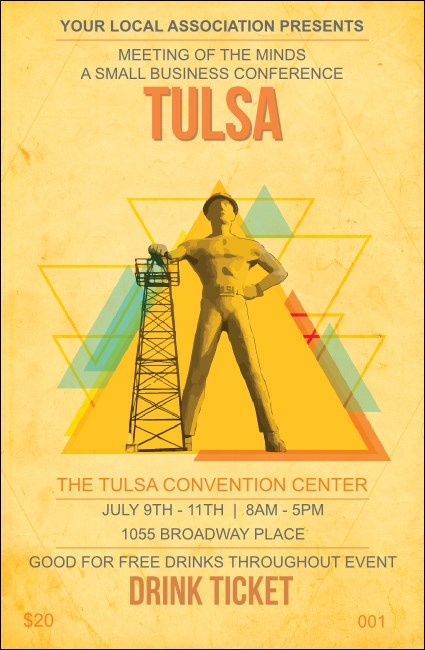 Celebrate the rich history of Tulsa with the Golden Driller at the Tulsa County Fairgrounds, with soft yellows, oranges, and blues in the design. Whether you're toasting the great arts and culture offered in T-Town or a Western Swing concert, make your event memorable with this unique Tulsa-inspired ticket. TicketPrinting.com has the right designs and the right ticket for your Oklahoma event!